Myles Kennedy (vocals), Frank Sidoris (rhythm guitar) and Todd Kerns (bass). As Slash ft. Myles Kennedy And The Conspirators--Slash (guitars), Myles Kennedy (lead vocals), Todd Kerns (bass), Brent Fitz (drums) and Frank Sidoris (rhythm guitar) are currently on their worldwide tour through Asia, New Zealand, Australia, Europe and the U.K., the group has announced they’ll kick off a headlining U.S. tour this summer. The U.S. trek will launch on July 15 in San Francisco and wrap-up August 13 in Orlando. Tickets will go on-sale this February 8 at 10 a.m. local time and are available at slashonline.com. 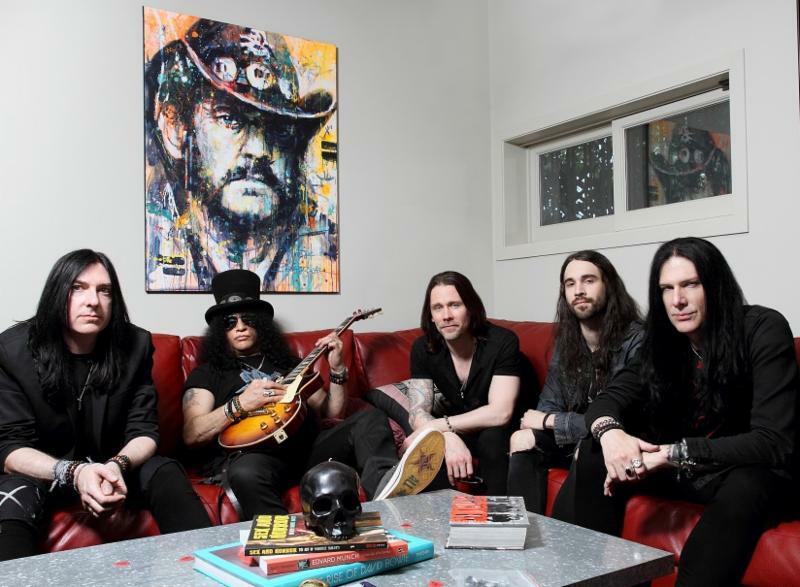 The iconic, GRAMMY-winning guitarist Slash and his band, Slash ft. Myles Kennedy And The Conspirators are touring worldwide in support of their acclaimed third album "LIVING THE DREAM" and will release the new single “Mind Your Manners” – which Rolling Stone hailed “a menacing blues-rocker” – to radio starting February 4. The song – which already debuted at #39 ahead of its official radio impact date--follows the first single “Driving Rain” – Slash’s fastest rising single to date—which recently became the band’s 5th Top 5 hit in a row at Rock Radio. "LIVING THE DREAM" (Snakepit Records/RoadRunner Records) is the third full-length offering from Slash ft. Myles Kennedy And The Conspirators. Fans can purchase or stream "LIVING THE DREAM" HERE. Fueled by the Top 5rock song “Driving Rain,” its live-action, animated video as well as the best critical acclaim of their career, "LIVING THE DREAM" debuted with 10, Top 10 chart placements around the world. The first single “Driving Rain” which jumped to the Top #5--marks the band’s 6th consecutive, Top 10 single at radio and Slash’s fastest-rising single ever in his solo career. SLASH--the iconic, GRAMMY-winning, American rock guitarist, songwriter and film producer--has amassed album sales of over 100 million copies, garnered a GRAMMY Award and seven GRAMMY nominations and was inducted into the Rock and Roll Hall of Fame. SLASH landed on the top of the charts with his first solo album, Slash (2010) which featured Ozzy Osbourne, Fergie, Myles Kennedyand more. Shortly after, he formed his current band SLASH FT. MYLES KENNEDY & THE CONSPIRATORS--which features MYLES KENNEDY (lead vocals), BRENT FITZ (drums), TODD KERNS (bass/vocals) and FRANK SIDORIS (rhythm guitar)--who’ve been touring worldwide and making music for over four years. SLASH FT. MYLES KENNEDY & THE CONSPIRATORS released the critically acclaimed Apocalyptic Love (2012) which stormed the Billboard Top 200 Albums Chart debuting at #4 as the top rock album. Apocalyptic Love has the added distinction of spawning SLASH’s first-ever #1 rock radio solo hits: “You’re A Lie” and “Standing In The Sun.” SLASHreleased Nothing Left To Fear (2013) the first-ever motion picture he co-produced from SLASHfiction, his film/TV production company specializing in the horror genre. He is currently working on a new film project. SLASH FT. MYLES KENNEDY & THE CONSPIRATORS unleashed their second album World On Fire to worldwide praise. The album’s title track, first single “World On Fire” ascended to #1 at U.S. Rock Radio. In 2016, Guns N’ Roses re-united and SLASH joined Axl Rose and Duff McKagan for the ongoing “Not In This Lifetime Tour” which Billboard now ranks as the fourth-highest grossing tour of all time.